Join us at St. Laurence Episcopal Church in Conifer for an intimate chamber recital featuring members of the Evergreen Chamber Orchestra! 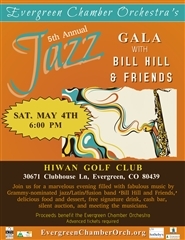 ECO presents its 5th Annual Jazz Gala fundraiser at Hiwan Golf Club on Saturday, May 4th. Purchase your tickets in advance! A portion of your ticket is tax deductible! Join the Evergreen Chamber Orchestra for our Season Finale Concerts which includes Brahms' delightful Hungarian Dances No. 1, 5, and 6. We'll conclude our 37th season with Schubert's masterpiece, the "Great" Symphony No. 9. Join the Evergreen Chamber Orchestra for our Season Finale Concerts including Brahms' delightful Hungarian Dances No. 1, 5, and 6, Schubert's masterpiece, the "Great" Symphony No. 9 and Corvina Graham the winner of ECO's Young Artists Solo Competition!